Few people alive today are old enough to remember the beginning of the coronary heart disease (CHD) epidemic in the 1920s and 1930s, when physicians in the U.S. and U.K. began sounding alarm bells that an uncommon disease was rapidly becoming the leading cause of death. By the 1950s, their predictions had come true. A decade later, a new generation of physicians replaced their predecessors and began to doubt that heart attacks had ever been uncommon. Gradually, the idea that the disease was once uncommon faded from the public consciousness, and heart attacks were seen as an eternal plague of humankind, avoided only by dying of something else first. According to U.S. National Vital Statistics records beginning in 1900, CHD was rarely given as the cause of death by physicians until after 1930. The following graph is from The Great Cholesterol Con, by Anthony Colpo. 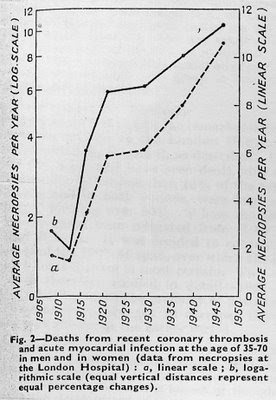 The relevant line for CHD deaths begins in the lower left-hand part of the graph. Other types of heart disease, such as heart failure due to cardiomyopathy, were fairly common and well recognized at the time. These data are highly susceptible to bias because they depend on the physician's perception of the cause of death, and are not adjusted for the mean age of the population. 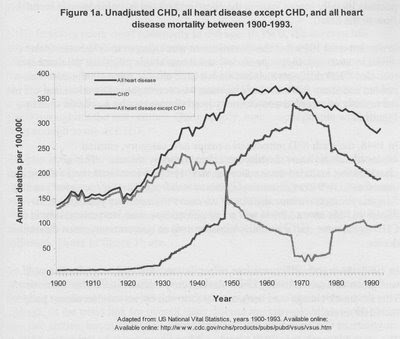 In other words, if a diagnosis of CHD wasn't "popular" in 1920, its prevalence could have been underestimated. The invention of new technologies such as the electrocardiogram facilitated diagnosis. 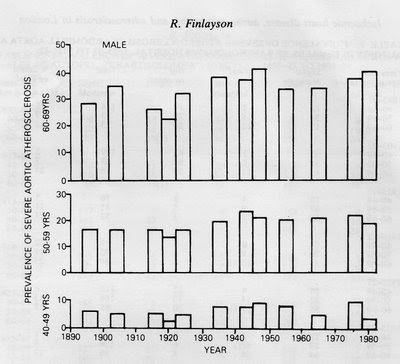 Changes in diagnostic criteria also affected the data; you can see them as discontinuities in 1948, 1968 and 1979. For these reasons, the trend above isn't a serious challenge to the idea that CHD has always been a common cause of death in humans who reach a certain age. The first possibility, of course, is that the increase is not real but merely reflects better post-mortem diagnosis. This is an unlikely explanation. There is abundant evidence throughout the forty years that the department was fully aware of the relation of infarction to thrombosis, of myocardial fibrosis to gradual occlusion, and of the topical pathology of ostial stenosis and infarction from embolism, as indeed were many pathologists last century... But what makes figures like these important is that, unlike other series of this kind, they are based on the routine examination at necropsy of the myocardium and of the coronary arteries over the whole period. Moreover Prof. H. M. Turnbull, director of the department, was making a special case of atheroma and arterial disease in general during 1907-1914 (Turnbull 1915). The possibility that cases were overlooked is therefore small, and the earlier material is as likely to be reliable as the later. The solid line is MI mortality. Striking, isn't it? The other lines are tobacco and cigarette consumption. These data are not age-adjusted, but if you look at the raw data tables provided in the paper, some of which are grouped by age, it's clear that average lifespan doesn't explain much of the change. Heart attacks are largely an occurrence of the last 80 years. He found the same trend in females. This casts doubt on the idea that coronary atherosclerosis is sufficient in and of itself to cause heart attacks, although modern studies have found a strong association between advanced atherosclerosis and the risk of heart attack on an individual level. Heart attacks are caused by several factors, one of which is atherosclerosis. What changes in diet and lifestyle associated with the explosion of MI in the U.K. and U.S. after 1920? Dr. Finlayson has given us a hint in the graph above: cigarette consumption increased dramatically over the same time period, and closely paralleled MI mortality. Smoking cigarettes is very strongly associated with heart attacks in observational studies. Animal studies also support the theory. While I believe cigarettes are an important factor, I do not believe they are the only cause of the MI epidemic. Dr. Finlayson touched on a few other factors in the text of the paper, and of course I have my own two cents to add. I'll discuss that next time. Another logical and striking blog, that must have taken a great deal of reading to find. Still, the rest of your blog had convincing dispelled any notion that heart disease was just one of those unavoidable things. I wait with bated breath for the next two cents! Very intriguing post! Thank you, Stephan, for digging up this compelling info. I suspect your next post may relate to the dramatic changes/industrialization in the food supply, which took off at the same time that this blog's data showed the steep increase in MI? Thanks for adding the RSS feed for comments! It's great to subscribe to the comments in my google reader and just go right to them, instead of opening posts and scrolling around. It also eliminates the need comment myself, just so I can more easily read the other comments in gmail. Your posts are always great, and the reader comments are the icing on the cake (gosh, I hate using all the grain- and sugar-related phrases but they are so useful). Interesting, but doesn't coronary calcium measure atherosclerosis, which appears to be extremely highly correlated with subsequent coronary events? Despite the assurances of the researchers, my guess is that coronary events were either undercounted or people died due to some other reason (e.g., infection) before a coronary event could occur. Great post...thanks for sharing your research. I hope your next post discusses your take on Mesquita's Myogenic theory - it just got even more compelling! Crystallized Cottonseed Oil, among others. Interestingly, the statistics for CHD deaths from pre 1939 Poland are very low, so was cancer (~5000 cases per year for a population of 36M). I don't remember the exact figures for MI death in the 30-ties but they were about an order of magnitude lower than a 2 decades later. Sugar used to be heavily taxed in Poland (gov had a monopoly on sugar, tobacco, alcohol and matches, and drew most income out of the stamp duties on those items). Therefore sugar consumption was very low. Unlike tobacco and alcohol, sugar cannot be easily bootlegged or people would have certainly done it. Sugar completely disappeared (verboten)during 1939-1945 occupation, and MI become extremely rare. It went quickly up after 1945, so did heart disease, cancer and TB. In the Western Europe sugar consumption went up after 1918. During the WWI sugar import to Britain did practically stop. That could explain a sudden jump around the end of the war period when the trade was resumed. There is a good discussion of this subject in Gary Taubes' "Good Calories, Bad Calories" book. Yes, calcium score (reflecting advanced atherosclerosis) is correlated with heart attack risk on an individual level. But having severe atherosclerosis does not mean you're going to have a heart attack, and having only mild atherosclerosis doesn't mean you won't. So severe atherosclerosis is neither necessary nor sufficient for a heart attack. A good example are the Masai. Dr. George Mann found that they had very low rates of ECG readings indicative of prior heart attack (plus low BP and cholesterol), and when he did 50 autopsies, many on older individuals, he found no trace of prior infarction in any of them. However, many had severe atherosclerosis. It's important to remember that they were eating a partially modernized diet by the time they developed severe atherosclerosis. But in any case, in that population, atherosclerosis was not sufficient to cause MI. So the most logical explanation in my mind is that atherosclerosis increases the risk of MI, but it's only one factor, and other factors must also be active to produce MI. I won't be posting on that anytime soon but it's an interesting theory that I'm keeping in mind. That's a very strong candidate!! I'm definitely going to mention it. Thanks for the statistics. Sugar is high on my list of suspects as well. I'll be posting a few graphs. Calcium only shows up on the CT scan after the plaque is stable with a hard covering. The dangerous stage is earlier when the plaque has a fibrous cover, subject to rupture and thrombosis. A high cardiac calcium score may be indicative of the presence of earlier stage plaques as well, but the plaques detected by CT are not the problem. Dr. Mike Eades and Anthony Colpo both discuss the role of excess ferritin (men are most likely to have this) in the manifestation of coronary thrombosis (clotting) and subsequent infarct. I haven't seen any studies that confirm this, but it might help explain why some populations and women with high degree of atherosclerosis have low rates of MI. And coronary arteries typical re-model around a plaque, increasing the cross-sectional area so that blood flow is maintained. Often, new vessels can form (vascularization) to increase blood flow to the heart muscle. In my opinion far too many interventional procedures (stents, CABG) are performed then really required. But they are very profitable. Ferritin is an interesting biomarker. It is the storage form of iron, plentiful in red meat, and also functions as an acute phase reactant. (promotes inflammation, blood clotting). So women menstruate until approx age 50, dumping out their excess iron. Ten years later their risk of heart attack goes up. Ferritin is also toxic to the liver and brain. It becomes elevated in alcoholism. It is just one piece of the puzzle and may only be a marker of disease. Still, if your ferritin level is elevated, why not donate blood? Stephan, do you know anything about ferritin levels in the Intuit or any of the more carniferous tribes? a cliff hanger!! I can't wait for the next post! I was wrong! Looking at your graph from Britain, the jump in MI begun exactly at 1914! It could not have been something they added to their diet but it must have been something that they subtracted, due to war restriction and shortages! Britain has been traditionally a big importer of butter, lamb and beef from their colonies - which would have ground to a halt in 1914. They must have switched to potatoes instead! The data from the US, OTOH, coincides with the Great Depression! Again we are talking about subtracting some food items rather than adding! We need more substantial detailed data to figure it out. Excellent post Stephan, as usual. I was unaware of those two key studies. I can add them to my teaching arsenal. Did you see the new Medical Hypotheses article offering a comprehensive, evolutionarily based hypothesis to explain the increasing incidence of cutaneous malignant melanoma in industrialize nations? I bloggeed about it today at Primal Wisdom. "Mortality was not increased in carriers of the mutation during the 19th and early 20th century; it rose after 1915, reached its maximum between 1935 and 1964 (standardised mortality ratio 1.78, 95% confidence interval 1.13 to 2.76; P=0.003), and fell thereafter." 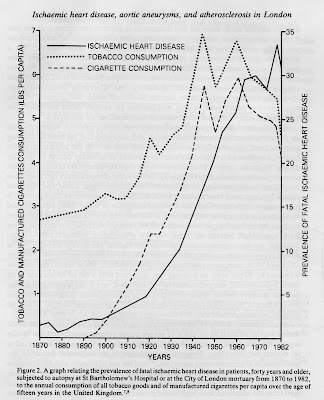 They predictably speculate about smoking and high fat diet being to blame for the increase in mortality after 1915. As for comments regarding excess ferritin and presumably higher hematocrit etc., I thought there was speculation that this could lead to excessive oxidation of LDL, exacerbating atherosclerosis. Might not be an issue if your LDL is not so easily oxidized. Thanks for the comment. It's interesting that Morris found that mild atherosclerosis (fatty streaks) had increased at the same time as severe atherosclerosis had decreased. Maybe they have different causes and different associated risks? I don't have any information on the ferritin levels of Inuit or other carnivores. However, the modern Inuit (with partially modern diets) have an unusually low rate of heart attack. People attribute it to the omega-3s, and I'd have to agree. I did read the section on iron in Protein Power, and found it interesting, but I haven't thought about it much since. Hmm. Perhaps. Or maybe it was the substitution of foods, i.e. hydrogenated fats so that the troops could eat butter. The incidence didn't fall after the war was over, so whatever the factor was, it persisted. I did hear about that article. It's interesting, although I think there are other mechanisms one could invoke as well. What/who do you teach, if you don't mind me asking? I've heard about that paper, I'm going to have to read it someday. As Malcolm Kendrick would suggest, there might be also a stress component involved. Life in trenches or during depressions tend to stress people. Since sugar will be high on the list of suspects in the next post, I would like to make a pitch for distinguishing the effects of fructose vs. glucose, or at least considering that the villain may not be sucrose per se, but one or both of its sub-components. The other consideration that bears discussion is distinguishing the damage caused by nutritional displacement vs. outright assault on health. 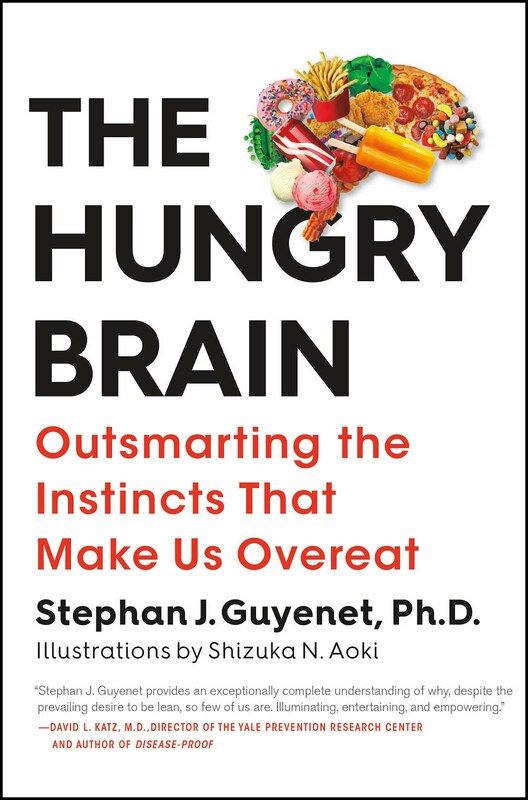 We all like to say "sugar is evil" - and I'm not disputing that it has earned its reputation - but at the same time we know there have been healthy native populations, as outlined by Stephan, who do well on diets that are very heavy on glucose. No, not pure glucose, but from Kitava to Africa to South America, there are groups who have ground, mashed, boiled and fermented various starches until they were highly glycemic and only a step or two removed from glucose. And after the processing they eat a lot of it, treating it as a dietary staple that supplies much of their need for energy. If these peoples have done well on glucose (in the context of their over all diet) then the suspicion must shift to the other half of the sucrose molecule, fructose. The deleterious impact of fructose has been discussed in this blog before. To maintain our scientific approach to nutrition (which I highly value in this online community), we must be careful about tossing all carbs into the same arena for bashing. Equating potatoes, for example, to sugar is inaccurate since the tubers lack all or most of the fructose component. Nutritional displacement, on the other hand, could implicate even glucose. If starch/glucose almost completely replaces a healthy traditional regimen, it is likely that the resulting poor health will be very similar to the result when sucrose fills the displacement role. But…there is a difference between damage caused by nutritional displacement and damage caused by displacement + liver overload. Glucose may be guilty of a sin of omission, so to speak, but sucrose (with its fructose component) is likely guilty of sins of both omission and commission. Got a little carried away with the religious thing there at the end, but you get my point. As usual, love this forum and love it when I see that a new post has been put up. I agree with your stance on carbohydrates. I recently came to the same conclusion a few months ago after looking over some of Stephan's past posts. I then explored the idea a little further on my blog: Can High-Carb, Low-Fat Be Healthy? You make two very important distinctions between a directly harmful food (fructose) and an indirectly harmful one (glucose). The latter distinction is the one theorized by Price to be the root of disease -- i.e. the "displacing foods of modern commerce." But one has to wonder if, instead of sucrose (glucose+fructose), the primitive tribes had switched to pure glucose -- lets say in the form of dextrose -- would their health would have deteriorated so dramatically? It seems to me that with adequate complete proteins and animal fats, humans can afford to be a little more liberal with their carbohydrate source/quantity, as long as it's not coming largely from industrial fructose-laden products. Even large quantities of fruit may be okay if the protein and fat-soluble vitamins are otherwise covered in the diet. I keep hearing about grains being the most detrimental thing to human health in the last 10,000 year. When I see graphs like this is becomes pretty clear that while the grain theory may be true, there was certainly something in the last 50 years that has steepened the decline. I wonder if it isn't the hybridization and genetic modification of grain that is at the heart of the most recent trend. In our effort to make grain more resistant to insects and disease are we in fact creating more anti-nutrients which are detrimental to human health. It could also be that as fat has be demonized, we have replaced it with sugar and grains in our diets which were really the culprit all along. I'm sure Stephan will figure it our. I have a gut feeling that when we invoke causes like "stress" or "ferritin" chances are we are shooting at the ghosts. I am not disagreeing with Malcolm Kendrick and I really like his book and essays. I am quite convinced that all these factors such as: stress, sugar, fructose, speaking English(*), too much iron, Chlamydia, Trevor Marshall's bacterial flora, polyunsaturated oils, hydrogenated fats, high carbohydrate low fat diets - they all must contribute to arteriosclerosis and do increase the risk of MI. However I think that they they probably do not constitute the direct trigger of MI because none of those factor is unique to the UK of 1915 and the US of the 1920-1930! However much I despise the purveyors of sugar and starch laden food, I do not think that these things are the direct triggers - they do weaker human health and cause all sorts of other chronic problems, but the characteristics of the MI epidemic of the 20-th century resembles all other INFECTIOUS epidemics, not some slowly changing trend like a food fashion. Besides if sugar were to be the main factor, then it should have happened earlier and more gradually, in the mid 19-th century, first among the European upper classes. That was probably not the case. One thing I am sure of: - the more I think about it the less I know! Could farming practices such as hybridization cause a steep infectious-like disease. Hybrid seed don't breed true and seed producers require that farmers buy fresh seed each year. This means that the genetic make up of our crops can change rapidly. From what I understand that these practices began in th 1920s. I'm no expert, but it seems to me that our entire food chain is rooted in a very few species of grains that we have engineered in that last 100 years. As we look at differences between the diets of different peoples around the world, maybe we need to look at where they get their seeds from. This is intriguing. Reusing the same batch of seeds year after year would make a certain patogen, a strain of bacteria (normal or nano?) fungi or viruses persist in the crop. I wonder if that could withstand the scrutiny. Whatever the trigger was, it showed first in the UK and very dramatically so in just a couple of years, whereas in the US the impact was delayed by ~5 years, and was increasing more gradually over a decade. It looks to me like a deficiency of animal fats in one's diet, especially butter, facilitates infectious diseases such as TB and it may as well facilitate an unknown triggering factor for MI, for the same reason. I have seen a paper a while ago which discusses the time-scale and social similarity between the large pandemics of TB in the 19-th century and the pandemic of heart disease of the 20-th century. It's quite strikingly similar! Coming back to Britain during the WWI, whatever a new food they used that replaced their former imports from overseas, it must have been home grown and it was probably not grains since that does not grow very well over there. It could have been potatoes (or other common vegetable!) As you may know, potatoes are bred seedless by splitting their bulbs into parts with "eyelets" and planting them back in soil, that grow into new plants. Any given breed of potatoes lasts typically several decades after that it has to be re-bred. Again, the time scale is similar to the CHD epidemics! In Poland, the 1950-ties witnessed a slow decline of the old very tasty strain of potatoes that had a high protein contents and had a yellow color, replaced with a newly bred strain that was white and very starchy (and also had a much higher yield per acreage!). I still remember the taste of the old ones that some farmers were still growing in Poland in small quantities for personal use up until the 1960-ties. Interestingly, the communist government used to blame potato beetle for the decline and the new potato strains were bred specifically to be resistant to the beetle! The beetle arrived into Poland around 1950, but it was spreading West to East affecting potatos crop in the Western Europe much earlier. The US may have been spared the worst impact since they had an alternative crops to potatoes such as corn and grains, which the Western & Northern Europe did not use as much. Wheat was grown mostly in the Mediterranean countries like France, Italy and Spain. Hmmm, that seems to ring a bell! I'm skeptical that stress is a dominant force in CHD at this point. The incidence of heart attacks kept increasing even after the wars were over. We're on the same wavelength. The only thing I would add is that there may be negative effects associated with any excessively sweet-tasting substance, due to an effect on feeding behaviors. I personally don't think grains are the worst thing to happen to humanity in the last 10,000 years, and I feel they probably aren't directly responsible for the CHD epidemic at all. Grains probably aren't 100% ideal, but there are grain-based cultures out there that don't seem to get heart attacks. If you believe the food consumption stats, we actually ate more white flour at the turn of the century than we do today. We weren't super healthy back then either, but we weren't having heart attacks. So unfortunately, I can't turn to one of my favorite punching bags on this one. It could still have played some role, but it wasn't what tipped us over the edge. However, grain processing has changed. White flour used to be aged naturally, whereas now it's bromated and bleached, a process that chemically alters it, creating scary chemicals like alloxan and presumably inactivating the phytase enzyme. I don't know if there's enough alloxan in flour to really be a problem, but in large doses it is used to give rats type I diabetes. Flour also used to be sourdough fermented primarily, which breaks down some of the gluten and most of the anti-nutrients. Modern bread is probably more toxic that what they ate at the turn of the 20th century. (1) Although some folks have stated that the "tide is turning" with respect to the popularity of the cholesterol theory of heart disease, among the doctors whose dictation I transcribe, from where I sit, it is alive and well--and being taught to the next generation of doctors (residents, interns, medical students). Lipid panels are popular laboratory items. Statins are still popular. Patients are still told to eat low-fat, low-cholesterol diets. (2) I think the tide is turning more with respect to the general public, more of whom are investigating and going low-carb against the advice of their doctors and other "health professionals." (3) What is *especially* horrifying to me is the seemingly large number of rather young people undergoing bypass surgeries (especially young men, as young as in their 30s). Thanks for your comment. There's still a lot of bad information floating around the medical community for sure. But many doctors really are getting it. 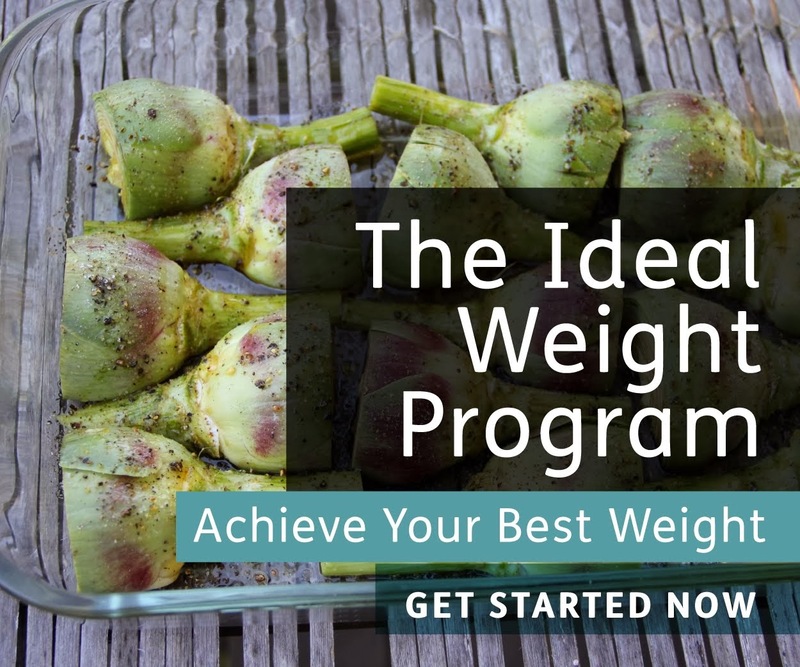 It's hard to ignore patients who lose weight and improve their health with low-carbohydrate diets, for example. You might be able to ignore it if you're a stubborn cardiologist. The thing that gets me about bypasses is that from what I've read, they don't seem to be a particularly effective intervention. Controlled trials haven't supported their effectiveness at reducing mortality. Yet we're still cracking open peoples' chests and draining their wallets (and everyone else's wallet) to do it. I'm reading Good Calories, Bad Calories right now - one of the best nonfiction books I think I've ever read, by the way, and I adore nonfiction - and Gary Taubes makes an awfully convincing argument that refined carbohydrates, especially sugar, are possibly/probably responsible for the various disorders that comprise metabolic syndrome (including CHD). Why would you use anything by Anthony Colpo. The man is NOT trained in medicine. He is a "fitness consultant". Anthony Colpo is NOT a relibale source of information by any means. He has misinterpreted and taken out of context many studies to support his hypothesis. There are many doctors who have torn apart the studies Colpo cites on yahoo answers. ckm1956 is one of them. I disagree. Every time I've looked up one of Colpo's references, what he claimed about it has been correct. If you'll notice, my favorite nutrition authority is a dentist. Being trained in medicine does not qualify a person to correctly interpret scientific studies or know the first thing about nutrition. I can tell you as a Ph.D. student, M.D.s do not receive the training necessary to critically interpret scientific papers. Many of them can do it well, but it's because they're intelligent people who took the time to teach themselves, not because they're M.D.s. So the fact that Colpo isn't an M.D. or a nutritionist doesn't bother me in the slightest. I never call anyone Dr. so-and-so in the comments section on this blog. Everyone goes by their first name here, and anyone with a good idea gets to voice it on an equal footing. That's because I've discovered that good nutrition-health information often comes from people without credentials. Colpo is one of the very rare people who actually seems to read the studies he cites in detail. However, I'm always interested to hear the other side of the story. I'd appreciate it if you could pass along the critique you mentioned. Although I don't see Yahoo answers by random M.D.s as a very reliable source. Anthony Colpo says "calories are everything" when it comes to fat loss. That is nonsense. Obesity is extremely complex with many variables affecting it. Some of these variables are symbiotes, pathogens, toxins, food quality , environmental factors, stress and genetics. The calorie theory can be refuted by an experiment with mice. Researchers took obese mice and extracted gut flora from them , and transplanted it into thin mice. Genetics amoung the mice were identical. A controlled variable. Food was also acontrolled variable- all the mice ate the same foods and got exactly the same calories each day. The thin transplanted mice became fat. Thin controlled mice remained thin. This experiment shows that intestinal flora are one of the variables affecting obesity, and it shows that there are circumstances where you can get results ranging from thin to obese with absolutely zero modulation of calories. I would bet $100 Anthony Colpo has no clue about this. I agree that calories aren't everything. I differ with Colpo on a few things as well, but overall I still think he wrote a great book. Stephan, referring to Mesquita's Myogenic theory of myocardial infarction we have a lot of stuff about it at http://www.infarctcombat.org. Perhaps you may find also interesting the acidity theory of atherosclerosis, published full and free at http://www.infarctcombat.org/AcidityTheory.pdf. The acidity theory complements the myogenic theory and reinforces the coronary-myocardial disease concept. Thanks for the links, I may take a look at some point. that I had read a while ago. So you are the son-in-law of Dr. Quintilaino H. de Mesquita who contacted Dr. Cowan? I am more and more suspicious that the whole cholestorol theory of heart disease is pretty much a red herring. Do you have any idea of the root cause of the lactic acid buildup in the heart? Is it diet-related? Hi Senta! Thank you for your question. As stated in the acidity theory of atherosclerosis monography I think the main cause of the increase in lactic acid production in the heart is related to psychosocial stress, although high carbohydrate diet may play an important role in this sense (For example the ingestion of glucose, fructose and other sugars may have the effect to raise blood lactic acid with this increase being most marked and lasting longest after fructose. Also, the autonomic nervous system may be influenced by high-carbohydrate dietary, with greater sympathetic nervous activity, with consequent increased production of lactic acid). Contrary to numerous clinical facts and pathologoanatomic studies, theoretical medicine believes that the only cause of coronary disease is impairment of coronary passability due to formation of atherosclerotic plates on vascular walls. However, the absence of coronary congestion in cardiac infarctions was proved by Baroldi’s numerous studies: he did not find any fresh or old blood clots in 50% of lethal cardiac infarction. Horn and Fine only reported 29% of coronary arteries constriction in cardiac infarction cases. If Baroldi completely refuted thrombosis as the cause of infarctions and believed that infarction is caused by myocardium transformations, Harland and Holburn, on the contrary, fully supported the classical theory of myocardial infarctions. You can judge yourself who is right. Data on the life expectancy dynamics in Russia, published in 2000, showed that a sharp increase in cardiovascular incidence and lethality in 1992-1994, called “cardiac epidemic,” coincided with the period of a mass vaccination of the population against diphtheria. It became clear that cardiac ischemia, infarction and other cardiovascular diseases have different, and first of all, immune nature. Universal mechanisms of human pathology are connected with a disturbance of physical integrity – spatial geometry – of a living organism as a result of interaction with a number of foreign factors and influences. The organic wholeness is determined, first of all, by physical, i.e. space-time regularities (patterns) that predetermine absolute otherness of each living being. Immunity is, entirely, an application of physical and physical-chemical mechanisms for detection and destruction (denaturation) of foreign autoantigens and antigens. Myocardial infarction in a living organism can be regarded as a physical reaction to the accumulation of a critical mass inside and outside of foreign spatial entities – autoantigens – forming as a result of various kinds of interference in the organism’s physical integrity from the outside, and also due to physiological stresses causing disturbance of cell membrane permeability and exit of intracellular proteins from cells. A sensitized living organism becomes a kind of a reactor or a melting pot, in which its own tissue that has become foreign is subject to inevitable annihilation (denaturation) and fusion, i.e., replaced by different spatial entities – dense connective tissues (sclerosis) resembling geological formations. This is not seen in other countries, what's the reason ?